While iPage’s shared hosting plans are offered at some of the best values in the business, the VPS hosting plans that they offer provide a unique combination of both value and quality. With dozens of web hosts in the industry offering VPS hosting services, it can be difficult to make a decision on which one best fits your needs. How Many Different Plans are There? iPage offers three different VPS hosting plans for users to choose from. The options include a Basic, Business, and Optimum plan. As would be expected, the major difference between the three packages is with the RAM, storage, and bandwidth available with each. The Basic plan comes with 1 Core, 1GB of RAM, 40GB of storage, and 1TB of bandwidth. Business plan users receive 2 Cores, 4GB of RAM, 90GB of storage, and 3TB of bandwidth. For users that go with the more advanced Optimum package, 4 Cores, 8GB of RAM, 120GB of storage, and 4TB of bandwidth are included. The Basic option is generally designed for users that are in the early stages of getting their website up and growing. The Business plan is usually a good option for someone that has outgrown shared hosting but is not quite to the point where they need a dedicated server. The Optimum plan is for users with a high traffic website that is somewhere in the neighborhood of 5,000 daily visitors. What is the Pricing Structure for the Three Options? As with all of the other hosting plans that iPage offers, the VPS hosting packages provide tremendous value to users. The Basic plan is priced at $24.99/month when paying on a monthly basis while the Business plan is $59.99/month. Optimum plan users will be paying $99.99/month for superior technical features. All three plans are offered at slightly cheaper prices for the first month. Users can also receive even further discounts by making 24 or 36 month commitments. You should be aware, however, that committing to a long term plan means that you will be billed annually. Yes. 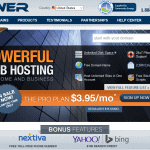 iPage provides a 30-day money back guarantee for their VPS hosting plans. You will not, however, receive money back for your domain name as it will be yours to keep if you happen to make the decision to leave their servers. How Many Domains and Sub Domains Can You Create? One of the best parts of all of iPage’s VPS hosting plans is that they allow you to create an unlimited number of domains and sub domains. This is vital for users that are looking to build and grow several websites at once and is one of the reasons that web designers love iPage’s VPS packages so much. The Basic VPS hosting plan comes with one dedicated IP address while the Business and Optimum plans both come with two IP addresses. Obviously these IP addresses are important for security purposes as well as to provide the ability to purchase and utilize a SSL certificate. What Control Panel is Used for VPS Hosting? All VPS hosting packages come with cPanel as the control panel. cPanel is the most commonly used control panel in the industry due to its ease-of-use and the fact that it allows users to manage everything about their account in one place. Optional root access is also included with cPanel. What are Some of the Main Features of cPanel? As has been mentioned, cPanel allows you to manage your entire account in one place. In addition, it makes it easy to create auto responders, mailing lists, catch alls, email alias, and just about everything else you will need to make your web mail efforts a success. You can even utilize Spam Assassin through cPanel. 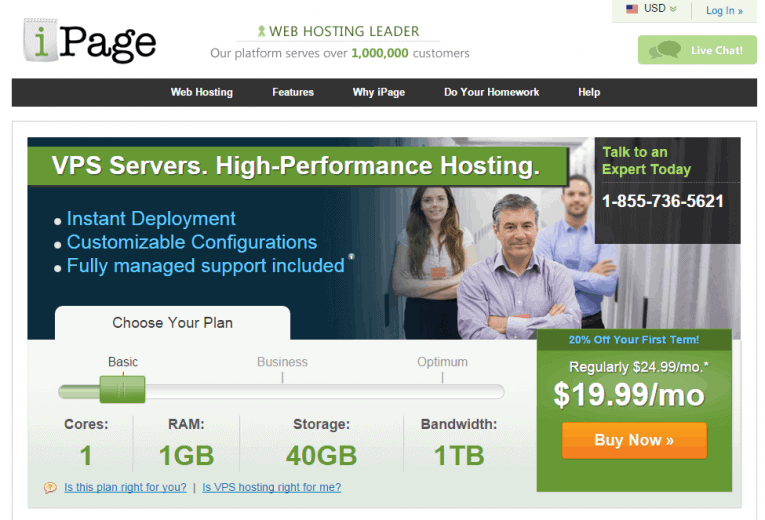 iPage offers standard customer support for their VPS hosting users. This includes 24/7 access to assistance via phone, email, or live online chat. You also have access to their knowledgebase and help center that features plenty of information about many of the basic features of your hosting plan. Each VPS hosting plan offered by iPage has an absolute ton of preinstalled scripts that allow you to program and code your website exactly how you please. Some of the main scripts include CGI, SSI, PHP, JSP, Perl, Cron, GD 2, Ruby on Rails, FrontPage, Python, and Curl. While iPage may not offer as many advanced features as a lot of experienced website owners would want, they do provide plenty of areas for customization. Yes. AWStats, which is a popular open source web analytics tool, is available with all three of the VPS hosting plans. This tool allows you to analyze a variety of different types of data that will help you improve and optimize your website. You can also receive logs and HTML reports from the tool. What Email Features Come With the VPS Hosting Plans? On top of being able to create an unlimited number of POP3 accounts, you also have the ability to customize your email address to match your domain. Some of the other main email features include the ability to create auto responders, mailing lists, and email aliases. Spam Assassin is included as well. Where are iPage’s Data Centers Located? iPage has two data centers, both of which are located in the Boston, MA area. Both locations run on N+1 power and are equipped with 24/7 security. The overall infrastructure is a pooled server environment, which is somewhat unique for the web host industry. A major feature of their data centers is the fact that they have several backup servers that are able to take over immediately if a primary unit goes down. Those secondary units are then backed up when an additional set of servers that have a copy of all data from the primary units. Is iPage an Environmentally Friendly Web Host? iPage has been at the forefront of the movement towards creating a more eco-friendly web hosting industry. In fact, they are so committed to this movement that all of their offices and data centers are 100% powered through wind energy. Very few other web hosts in the industry can make this claim. As with all of the plans offered by iPage, value is the main advantage of choosing one of their VPS hosting plans. They provide all of the basic features you need to get started and even have advanced features to help you grow a high traffic website through their network. While the shared hosting services that iPage offers would not be recommended for professional use, the VPS hosting services should undoubtedly be considered as a solid option. The combination of security, reliability, and affordability is something that is hard to find with other web hosts. Hopefully this short review will help you make the decision about which plan is best for you.